The Fraxel Re:Store® laser is a non-ablative fractional laser for the treatment of aging and sun damaged skin. This laser will also treat acne scars and surgical scars. It can target both the superficial and more deeper levels of the skin so it is a good all-round laser. 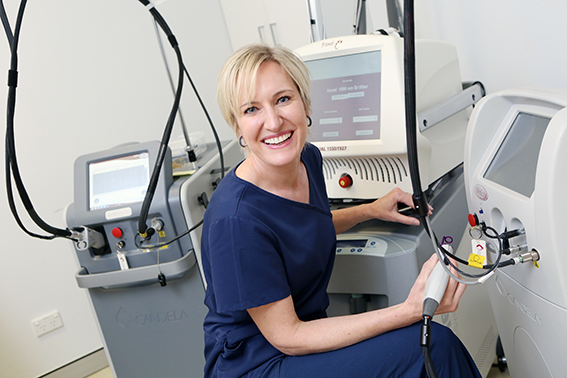 A fractional laser is a laser that treats only a small column of tissue at a time. Multiple columns of treated skin are used, leaving the surrounding skin to help with rapid healing. What Does a Fraxel Re:Store® Laser Treat? This is a unique laser that has 2 laser systems in 1. There is a 1927nm laser that treats more superficial skin conditions such as pigmentation and improving the skins tone and texture. The 2nd laser is a 1550nm laser that treats deeper skin which is better for wrinkles and scarring. This laser will also improve the tone and texture of skin. The healing time or "downtime" after treatment will depend on which wavelength (1927nm or 1550nm) laser is used and the intensity of the treatment. After a 1927nm treatment, you will notice redness and possibly mild swelling over the next few days. This settles and is replaced by a brown sun-burned look which resolves over the next week. You will get flaking of the skin to allow for the new fresher skin to appear. This will depend on what skin condition you are having treated. Typically for brown marks (pigmentation) on the face only 1 or possibly 2 treatments are needed. For scarring this can be 4 or 5 treatments.